The influenza season in Europe is over… until next year. Influenza remains one of the most important public healthcare problems, especially in risk groups. Figure 1. Influenza A life cycle, indicating target molecules for which specific antibodies have been developed.Influenza virus can cause annual epidemics of approximately 500,000 deaths per year worlwide, which is facilitated by the high mutation rate of the viral genome and polymerase. The function interplay between hemagglutinin and neuraminidase glycoprotein characterises the pathogenic profile of each viral subtype (1). The Influenza A virus (IAV), mimicked as misfolded protein aggregates, carries unanchored ubiquitin chains to exploit host cell’s aggresome processing machinery for efficient IAV entry and capsid dissociation (2). For studies involving IAV, it is important that antibodies recognise the specific viral subtype, with high specificity, to avoid any cross-reactions with other subtypes that may not be relevant that season. One example of application of validated antibodies is the publication by Belardo, G. et al. (2014). They investigated the anti-influenza activity by using combination therapy of NTZ with neuraminidase inhibitors against broad range of Influenza A viruses and found positive outcome showing synergistic effect. 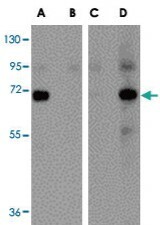 This anti-nucleoprotein monoclonal antibody was used in this study for the detection of viral replication via immunocytochemical staining. Figure 2. Viral subtype- and species-specificity of validated antibodies. Another example is shown in figure 2. Specificity of antibodies was proven by Western blot analysis of Hemaggutinin using recombinant seasonal Hemagglutinin (Lanes A & B) and swine-origin Hemagglutinin (Lanes C & D). Lanes A & C were incubated with Seasonal H1N1 Hemagglutinin polyclonal antibody (Cat # 157PAB16767), while lanes B & D were incubated with Swine H1N1 Hemagglutinin polyclonal antibody (Cat # 157PAB16769). Studying influenza? Getting ready for next season? Leave your comments! 1.- Short, K.R., et.al. (2014). Lancet Infect Dis http://dx.doi.org/10.1016/S1473-3099(13)70286-X. 2.- Banerejee, I., et.al. (2014). Science. DOI: 10.1126/science.1257037.